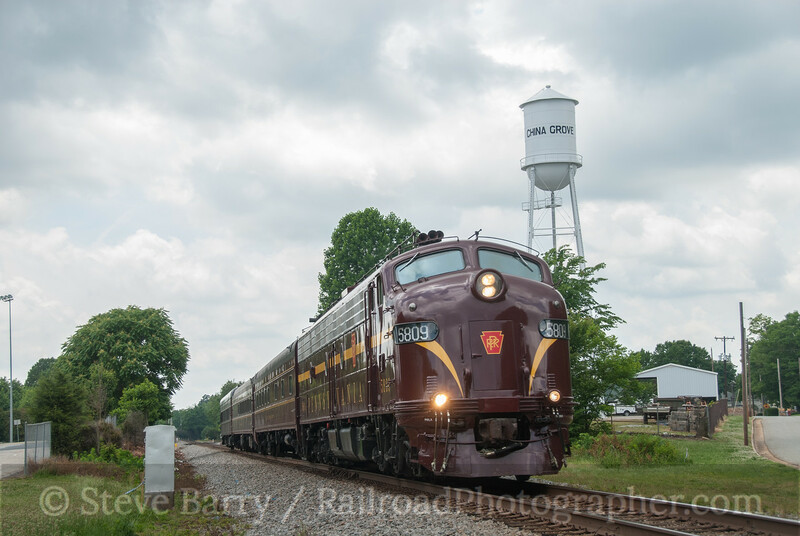 In the last post we visited Streamliners at Spencer at the North Carolina Transportation Museum. 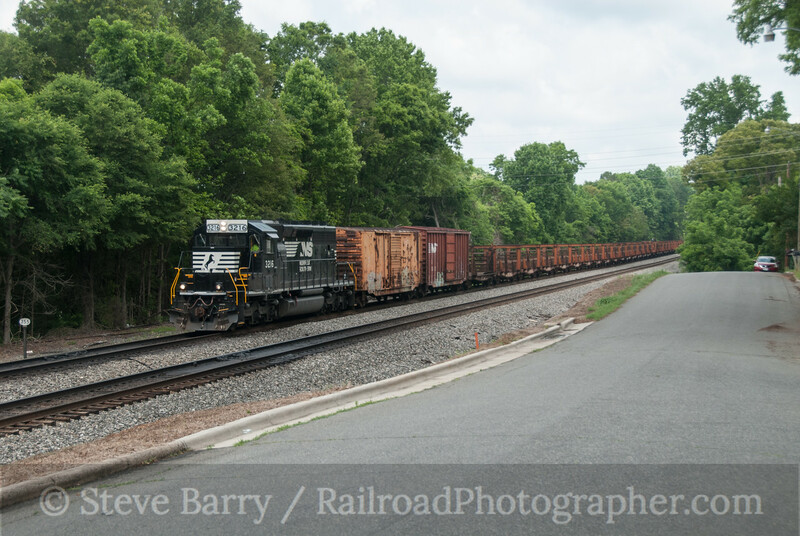 Spencer is located just north of Salisbury along the former main line of the Southern Railway (now a part of Norfolk Southern). 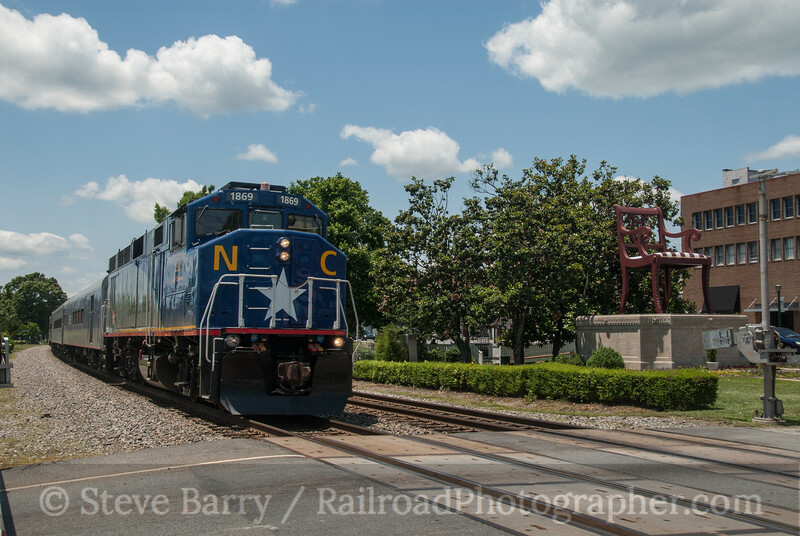 This afforded a few opportunities to get out and shoot NS and Amtrak action in the Tarheel State along the railroad that claimed "Southern Serves the South." 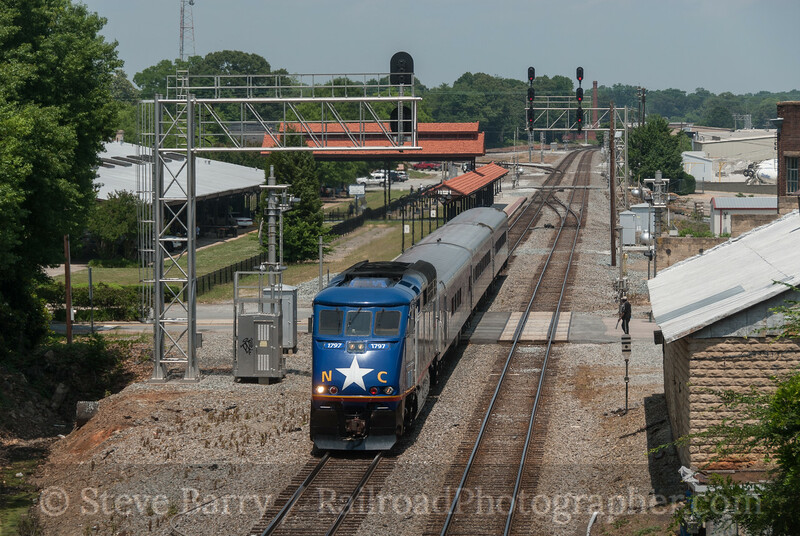 We'll start north of Salisbury at Thomasville where we find a southbound Amtrak Piedmont train passing under a classic Southern Railway signal bridge. 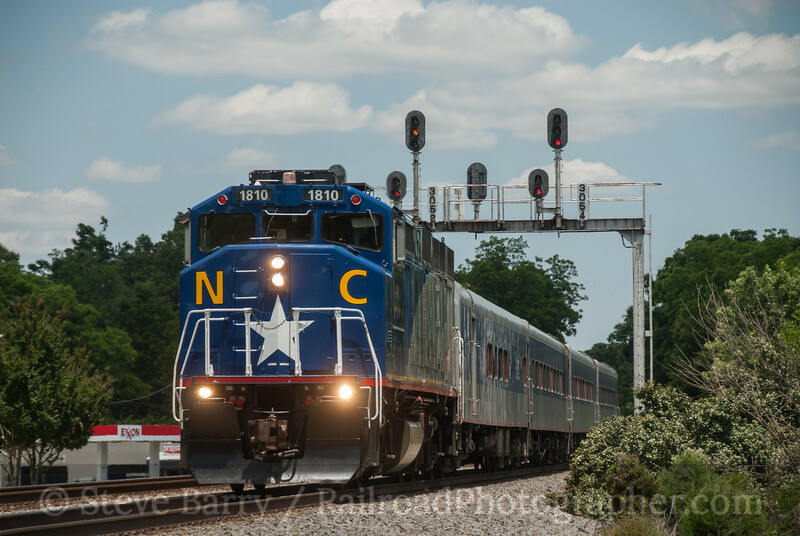 The train is paid for by the North Carolina Department of Transportation, which provides the state-painted passenger equipment including F59PH No. 1810 (above). 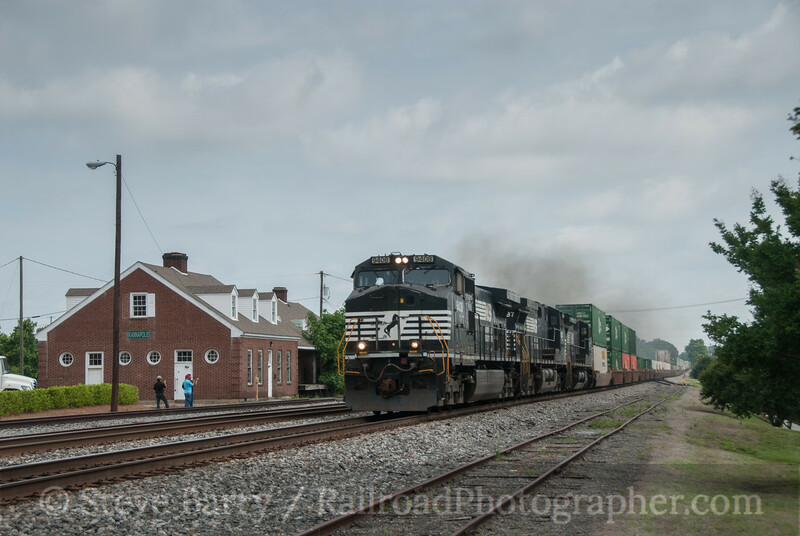 Moving just a little bit south, we find a northbound Piedmont train passing through downtown Thomasville behind F59PH No. 1869. Thomasville is well-known as a furniture manufacturing city, and the giant chair at the main grade crossing in town is a landmark. Moving down to Salisbury, we find a visitor coming off the wye on the line to Asheville and entering the Southern main. Juniata Terminal's E8 No. 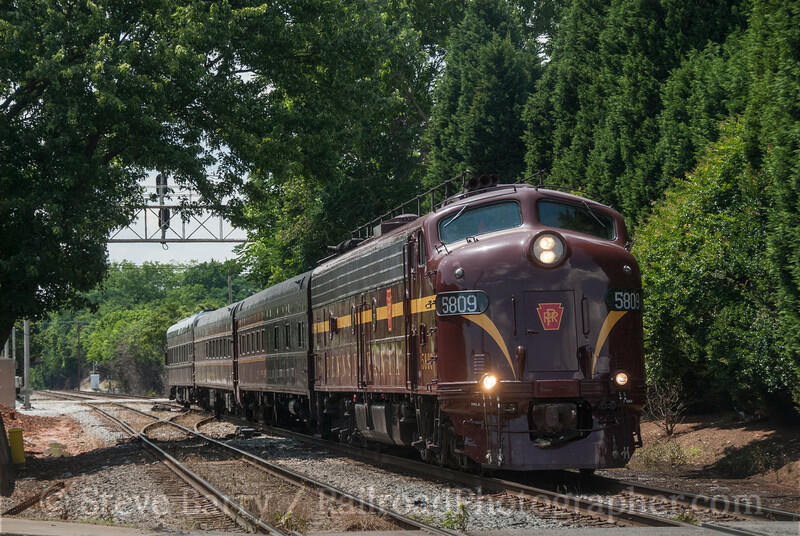 5809, proudly wearing the pinstripes of the Pennsylvania Railroad, ran a couple of Charlotte-Spencer round trips and turned on the wye each day for the trip back to Charlotte. The Salisbury depot has been nicely restored. Many tracks have been removed over the years, especially those close in to the station, but a new walkway leads out to refurbished platforms at the main line. A Norfolk Southern freight behind SD70M-2 No. 2776 heads through the station. Just south of the station are two overhead bridges. From the northernmost of the two bridges we see a southbound Piedmont train accelerating away from its station stop. Just south of the second bridge is an old ice house dating from the early 20th century. 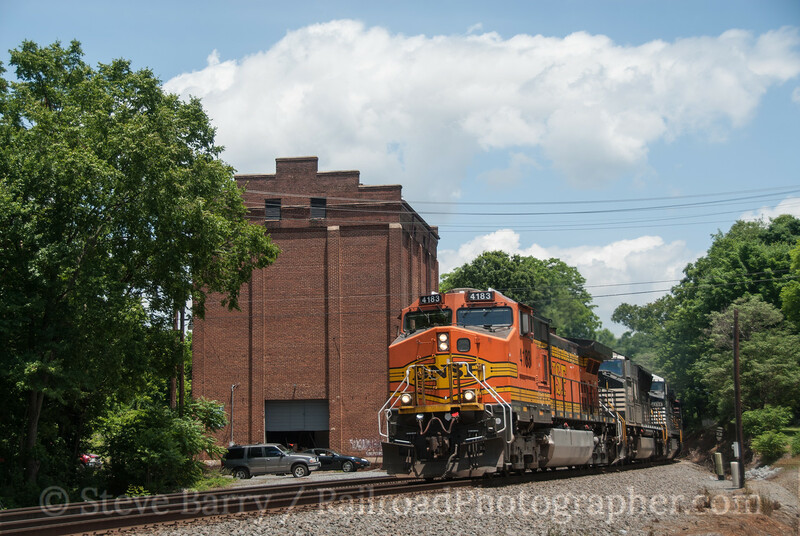 A freight led by BNSF Railway C44-9W No. 4183 heads south past the brick building. Continuing south the next town is China Grove. 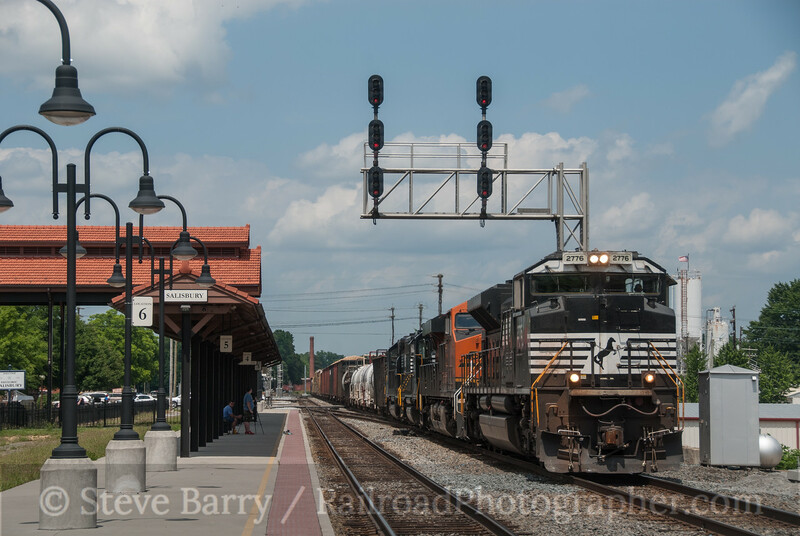 We see a northbound NS freight with a BNSF locomotive tucked between two NS locomotives. 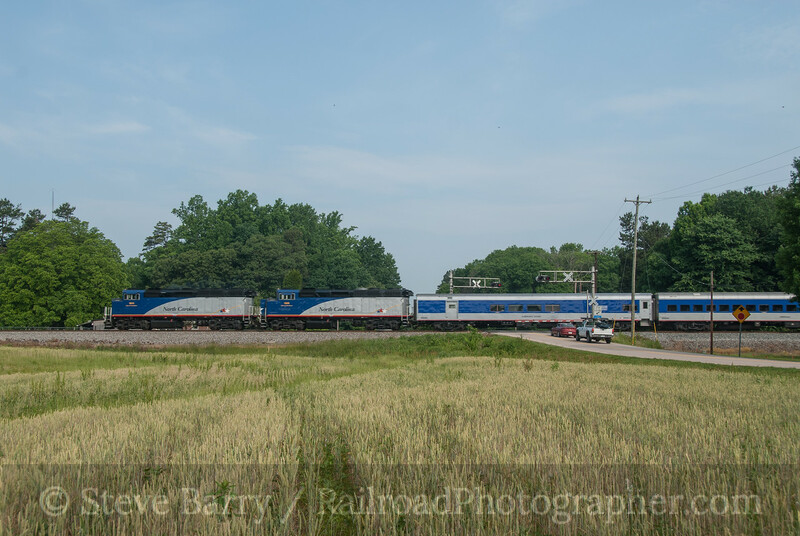 At the same location we see a southbound Amtrak Piedmont train. Surprisingly, this train has two locomotives leading. Moving from the fields between Salisbury and China Grove to the north end of China Grove, we once again encounter Pennsylvania Railroad E8 No. 5809. The train is heading north from Charlotte with NS dignitaries and others onboard bound for Streamliners at Spencer. Continuing south, we arrive at Landis. 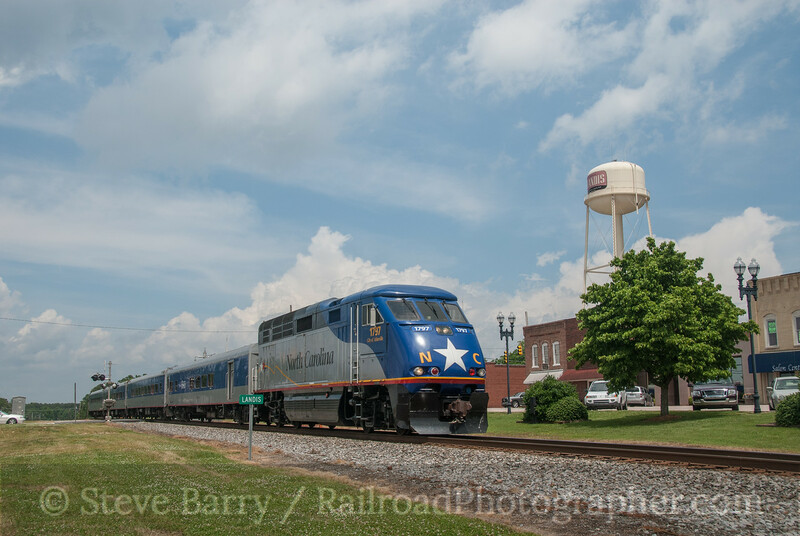 We see a southbound Amtrak Piedmont train rolling through the wide plaza that hosts the former Southern Railway main line. We now arrive in Kannapolis. The former Southern Railway freight house is still standing here, complete with its green SR sign. About a quarter mile south is the town's Amtrak station. C40-9W leads a southbound NS freight past the ex-Southern building. Turning around the other direction we see a northbound freight. This time we have power from Union Pacific on the point in the form of ES44AC No. 7491. Finally we wind up almost into the town of Concord. 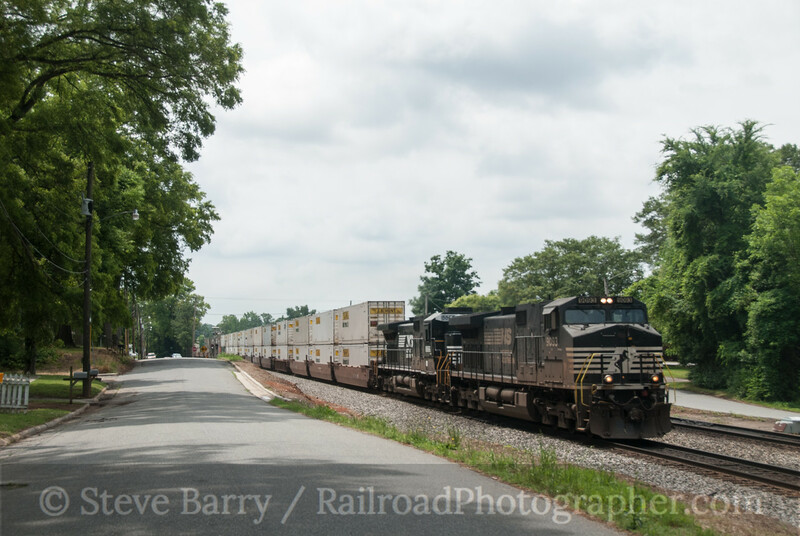 We see a Norfolk Southern work train heading south with empty rail cars trailing SD40-2 No. 3216. 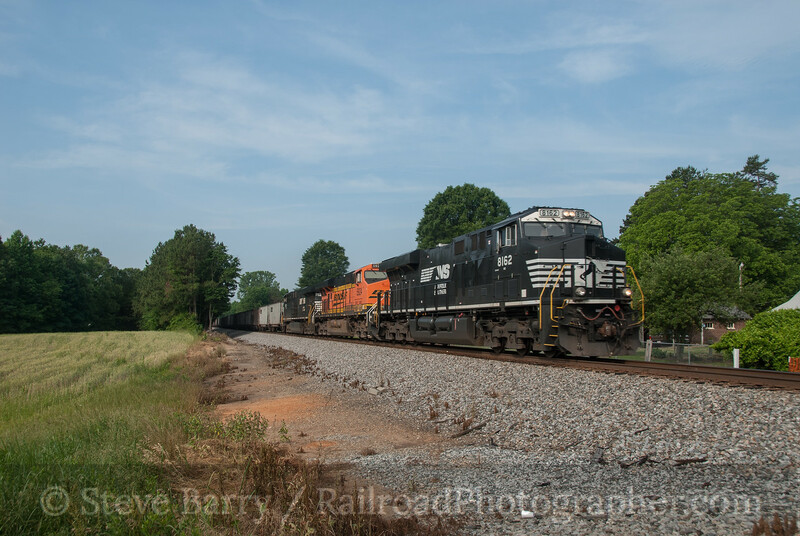 And finally we turn around to see a northbound NS intermodal train at the same spot. C40-9W No. 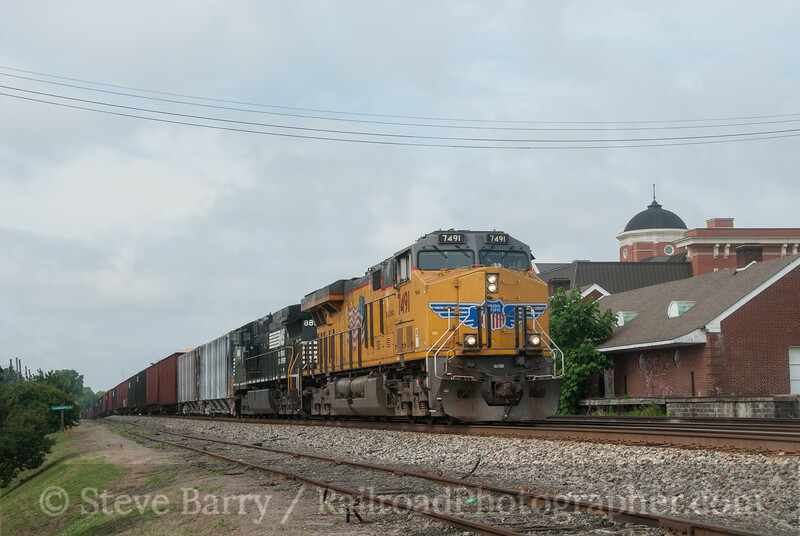 9093 leads a double-stack train of J.B. Hunt containers. More photos from along the former Southern Railway main line can be found scattered about in the various photo albums here.